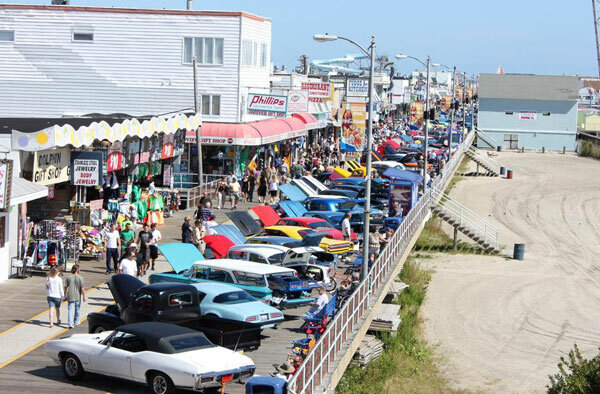 Wildwood:The Jersey Shore boasts some of the most crowded vacation destinations going. However, one popular resort, The Wildwoods, is truly a happening place and well worth the trip despite the crowds. 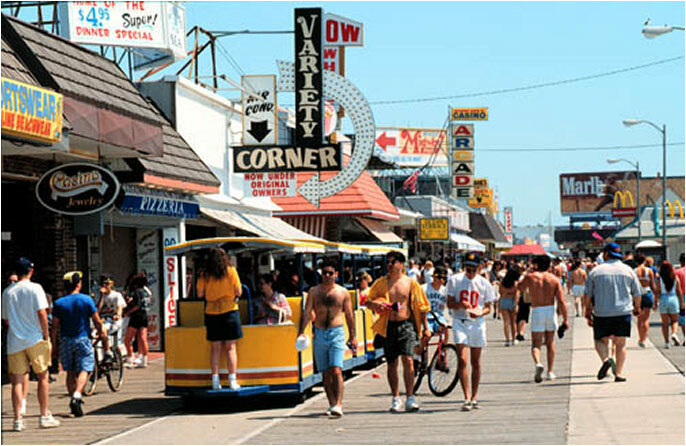 Much of this venerable beach community took off in the 1950s with the opening up of the Garden State Parkway and the Atlantic City Expressway. Many of the hotels still gracing the area still reflect that fifties look: tail fins, big hair, Elvis, and more. Old hotels with a bit of tackiness to be sure, but still a fun place to check out. The boardwalk is a two mile trek laced with all kinds of stores selling saltwater taffy, t-shirts, trinkets, games, rides, junk food, you name it. If you don't like to walk, tram cars will take you to the end or to any point in between. 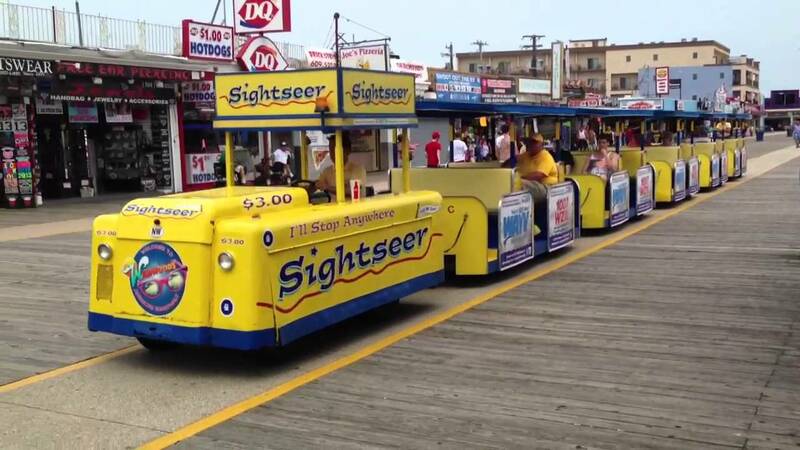 Soon, you will hear the familiar "watch the tram car" recording emanating from the cars and all you have to do is flag one down, hop on, and you're off. The beach is free, by the way. And, it is very wide particularly by NJ standards. 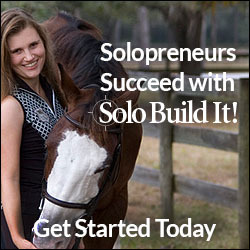 Most people familiar with the Jersey Shore know that many beaches are razor thin. This beach has sand added to it constantly and naturally by compliant tidal waters; it is at least 1/4 mile from boardwalk to surf [in low tide, that is]. Wildwood now boasts a convention center built on the beach and new rides jutting out from its piers. Historic Cape May, home to more than 600 Victorian houses, is only four miles to the South and a great place to visit when you get tired of the boardwalk scene. Atlantic City is one hour to the north and is a frequent side trip destination, especially on rainy days. Alternatively, you can also escape to the county zoo for the day in the town of Cape May Court House. The best time to go to the Wildwoods is during July and August as the water temperatures can be too cold before that time. Still, most hotels have outdoor heated pools which you may prefer to salt water. The resort is changing as many old buildings are being torn down and replaced by condos. Preservationists are attempting to maintain the family welcoming theme of the resort, so it remains to be seen what the resort's future will be. 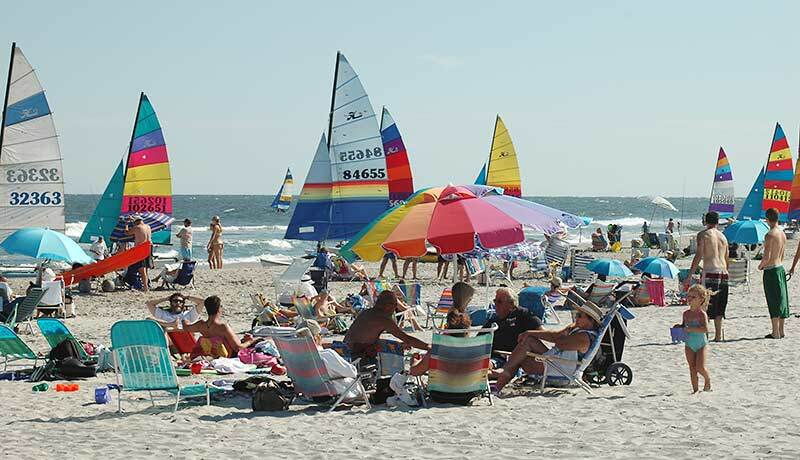 In the meantime, grab a beach towel and your sunblock and head over to wonderful, Wildwood, NJ!